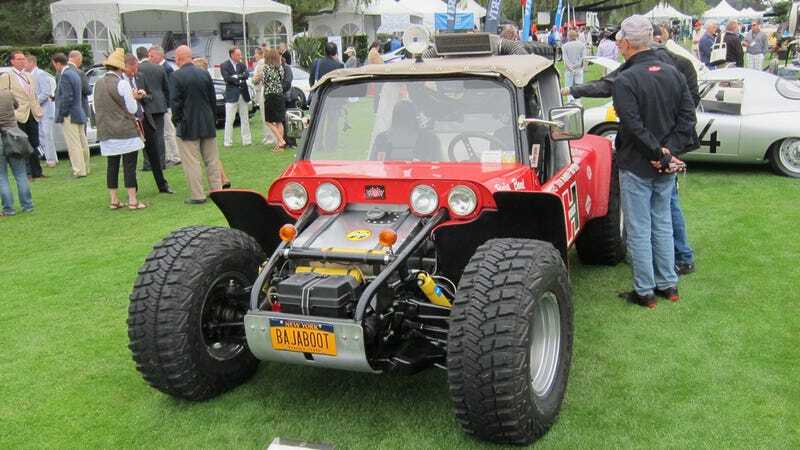 The golf courses surrounding Pebble Beach flood with Bentleys and Jaguars and exotic Italian cars every August, but there's only one Baja racer driven by Steve McQueen. And thanks to new owner James Glickenhaus, it's been upgraded to 100% street legal. Built in 24 days, the Boot ran the first of what would become the Baja 1000 in 1967; McQueen raced it himself twice, with both efforts ending early due to broken parts. McQueen's partner in dust Bud Ekins won the race with the Boot in 1969, and it ran desert races successfully for much of the '70s before retirement. The Boot is strange. The GM engineers who built it — some of whom also built the lunar rover for NASA — reversed the normal engine layout, so that the radiator is at the back end, with the 350-cu. in. V8 engine and transmission pointing rearwards. Fuel gets squirted through a wonky experimental Weber injection system, and the fuel sits directly in front of the windshield. Glickenhaus told me he wanted a car "that I could survive the apocalypse with," and in that the Boot is clearly qualified. And per standard Scuderia Glickenhaus operating procedure, the Boot is now registered for everyday driving in New York — thanks in part to GM's decision to give it a VIN for an experimental Chevy in 1967. Wave the next time you see it.